The first book of Ruth Lampi’s Blackfeather Chronicles, The Alarna Affair, is now posting on Wattpad! New chapters are going up weekly. 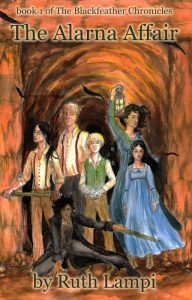 Of course you can also read this fantasy adventure story right here on The Five Wits Press’s website, but if Wattpad is your reading platform of choice, head on over there and check it out. And if you like it, don’t forget to vote.